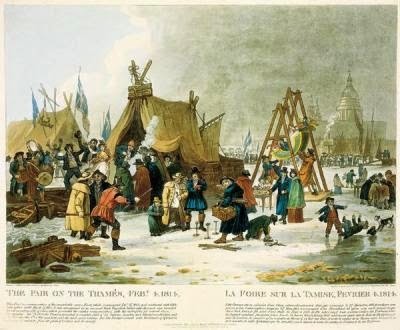 This Fair will long be remembered by thousands who had the courage to venture upon the ice on the Thames, during its continuance, large quantities of which had floated up the river on Sunday the 30th of January, and on the return of the tide it came down again in such masses, that at London bridge the arches were not wide enough to enable it to pass; in consequence of which it completely chocked up the Thames between London and Blackfriar’s bridges. In a very short time after one o’clock a man ventured to cross from Bank-side to the City, although the ice was then moving about in large pieces, but before the tide could return, it became wedged so close together, that it was immoveable, and on Monday morning the 31st, several adventurous persons crossed the river, and their example was followed by a multitude of men and boys, that reached in a continued line from Queen-street stairs to Bank-side. The bridges were covered with crowds of people, expecting every moment to see them all go to the bottom, but it remained firm, and it drew on others, who ventured nearly over every part from London to Blackfriar’s. A few places nearest Blackfriar’s being still too weak to bear weight, some few fell in; after this it was thought so secure, that no one who had the least curiosity thought of danger; only how they could make up one of the thousands, men, women and children moving backwards and forwards in every direction. 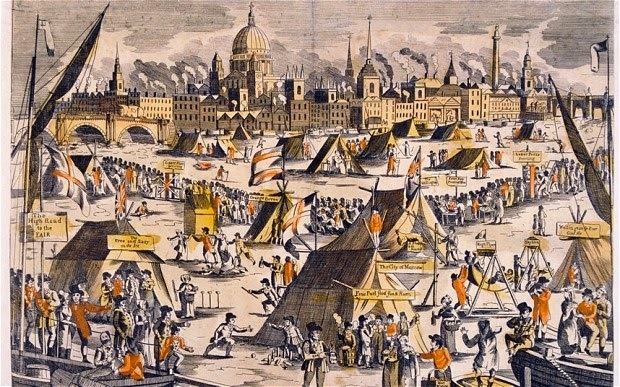 There was a complete path or grand street from Bankside to Queen-street, and Queenhithe, with a board nailed on a flag staff, calling it the New City-road, and each person that passed paid the watermen a penny to go down a plank upon the ice. There was another principal path from Bridge-street side of Blackfriar’s bridge, to the centre arch of London bridge, in a serpentine or zig-zag direction: these two paths were filled with persons as thick as they could walk; there were also paths from other stairs, but not so fully attended; in these there were about thirty booths, hoisting the flags of all nations, and painted with Cherokee taste, erected for the sale of porter, spirits, gingerbread, and other eatables; most of the booths had some sort of entertainment besides eating and drinking, some with a fiddler, dancing, others at skittles, &c., and all with fires; in the principal paths were a great many shops and stalls for the sale of all sorts of toys, trinkets, gingerbread, books, and low gambling such as the E O tables, Te-totum, Rouge et Noir, wheel of fortune, the garter, &c.
Every vender of the different commodities gave his customer some token printed for the occasion. On Thursday the 3d, a sheep was roasted, or rather burnt, nearest to Bankside, over a charcoal fire, in a large iron pan. The admission to the booth where this culinary skill was displayed, was sixpence each. 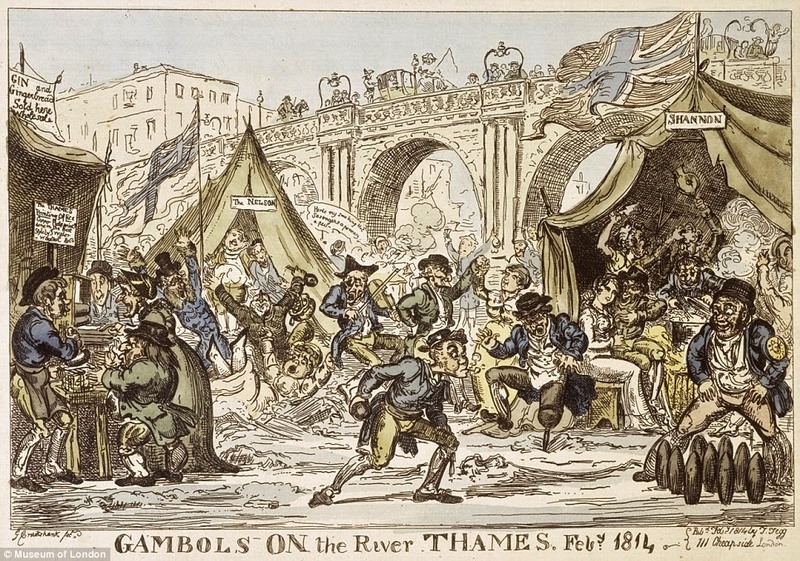 There was also two swings on the ice, which met with a few customers; there was a barge almost oil one side, near the centre arch of London bridge, fixed in the ice; it was taken possession of by a party with a fiddler; they hoisted a flag, and made merry; others did the Fame; but the ice being so rugged and dangerous nearer the bridge, few ventured to the edge; some however did, and even got on the starlings of the centre arch, although it was covered with ice like glass; two of them, however, paid for their temerity, by slipping off, and were with much difficulty saved: after this others ventured on the same expedition, to write their names and date under the arch. Skating was impssible, it was so very rough; here and there a small slide was made, but the masses which had been united were composed of large lumps of snow frozen together; many places they had only joined at the top; and when they were broken through, were really dreadful to look at. On this day (the third) a plumber named Davis, attempting to cross near Blackfriar’s-bridge with some lead in his hand, sunk between, two masses as above described, and rose no more. Every hour increasing the numbers of visitants and amusements, on the 5th the newspapers began to warn the people of the danger of a sudden thaw, upon the then state of the tide, and the Lord Mayor also issued orders for all booths to be struck on the Saturday evening; in consequence many had withdrawn, though several remained to a very late hour. On Sunday morning February the 6th, at two o’clock in the morning on the flowing of the tide, a dreadful explosion took place, and those who had not paid attention to the Lord Mayor’s orders, or the caution given by others, shared a fate that few pitied, although, as fortune would have it, not a single person was lost: nothing could describe the crush; in a moment every tiling flew the same way as if a sudden blast of gunpowder had exploded. Barges, lighters, wherries, and every kind of vessel on the Thames was dashed to pieces; several barges lying off Queenhithe, Paul’s Wharf, and the Three Cranes, were broken in two; their sides crushed in, and the immense large piles, full 18 inches square, that they were fastened to, were snapped as short as a match, and splintered to bits. Mr. Lawrence of the Feathers, in Timber-Street, Queenhithe, had erected a booth opposite Broken wharf, for the accommodation of the curious. At nine o’clock at night he left it to the care of two men, taking away all the spirits and liquors, except what little he left for the two men for their own use; when the explosion took place at two o’clock the booth was hurried along with the quickness of lightning towards Blackfriar’s-bridge. There were seven men in the booth at the time, and in their alarm at the violence of their progress, they neglected the fire and candles, which communicated with the covering, which had cost 40l., being a very large tarpauling, and get it instantly on fire. Among the casualties on the river, on Friday, was one in which the interposition of Providence was most strikingly manifested. About five o’clock, three persons, an old man and two lads, having ventured on a piece of ice, above London-bridge, it suddenly detached itself from the main body, and was carried by the tide through one of the arches. The persons on the ice, who laid themselves down for safety, were observed by the boatmen at Billingsgate, who, with laudable activity, put off to their assistance, and rescued them from their impending danger. One of them was able to walk, but the other two were carried, in a state of insensibility, to a public house, where they received every attendtion their situation required. 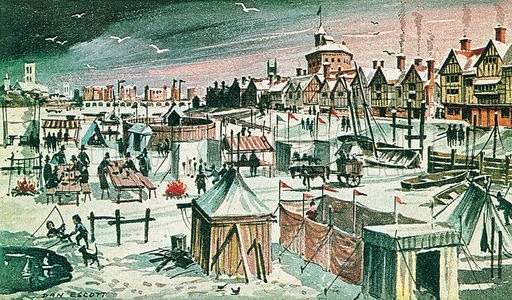 Friday a fair was held upon the ice at Chiswick. 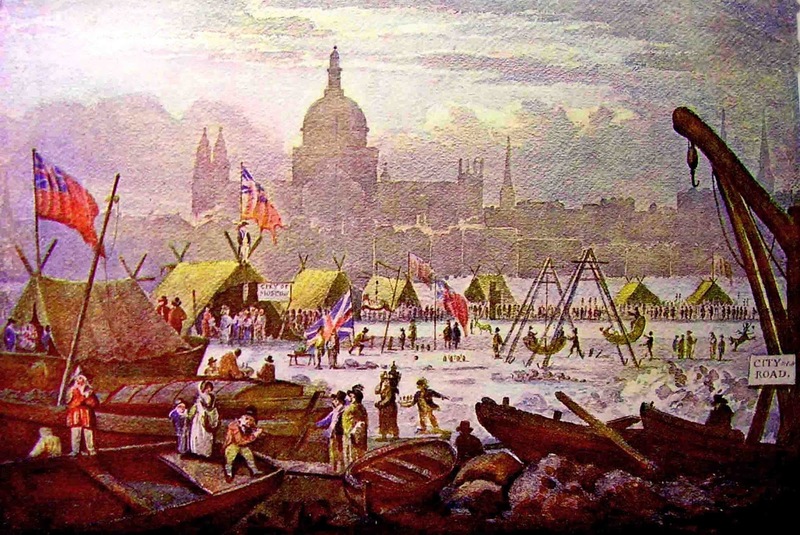 A great number of booths and shows of every description, were splendidly fitted up on the Thames. On Saturday, a fisherman’s boy, of the name of Carter, incautiously ventured, at low water, on a large sheet of ice, near Westminster-bridge, which, from the turning of the tide and the thaw, suddenly separated from the side and carried him up the middle of the river, towards Milbank, where his cries attracted the notice of a waterman, who put off to his assistance, and fortunately, by the application of his oars, relieved him from his perilous situation.